This issue of Dutch Carillon News looks much like the festival supplement of a news paper. Most music genres have their own niche. Such a genre lives at some festival terrain in the middle of nowhere, making sure it doesn’t disturb the other genres. What a difference when you look at the carillon habitat. All merges and melts together, often in the middle of a busy city. Mine and thine become vague categories. There are more latent listeners than on any of the ‘other’ festivals. It is just a matter of harvesting. And if we consider the inventiveness, the enthousiasm of the organizers and the quality of the music, we are bound to succeed. I wich you lots of campanability during the last weeks of the summer! Dordrecht/Amsterdam – Twelve carilloneurs from Berlin, Lyon, Birmingham, Bruges and other European cities, take part in the Eurocarillon Festival, from 18 to 20 August in Dordrecht and Amsterdam. 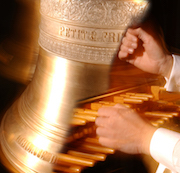 Next to recitals for carillon solo, there are concerts in which the carillon is part of an ensemble. Various travelling carillons will be presented, among them the smallest travelling carillon in the world. A variety of music will be played: from original compositions for the carillon to arrangements, from classical to modern, from folk songs to well-known film music. On Friday 19 August the carilloneurs will play the Amsterdam carillons of Westertoren, Munttoren, Zuidertoren and Oudekerkstoren, at 12:00, 14:00, 16:00 and 18:00 h. They will swap towers during the day. At 19:00 h. the day will be concluded with a recital on the bells of the Oude Kerk. Gidon Bodden and Boudwijn Zwart will play a new composition by the Dutch composer Jan-Bas Bollen. The Amsterdam towers are located on walking distance. The carillons can best be listened to from the streets nearby each tower. On Thursday 18 August from 19:00 h. and on Saturday 20 August from 14:00 h. the carilloneurs will play the carillons of the Stadhuistoren and Grote Kerkstoren in Dordrecht. In Dordrecht will be present the Bell Moods Concert Carillon, a travelling carillon made by the Manousek foundry (Czech Republic), and the miniature carillon of the Italian Allaconi foundry. Five brass players of the Dutch Tower Music Ensemble will make the concerts even more attractive. This is the third edition of the Eurocarillon Festival taking place in the Netherlands. Earlier festivals were organized in Belgium, France, Spain, Germany, the Czech Republic, England and Ireland. The festival is open to experiment: at the upcoming festival a free-jazz singer from Lithuania will sing with the carillon and in another concert the carillon will be combined with a singing saw. The entrance to all concerts is free. Jacob van Eyck is probably Utrecht’s most important musician of all times. The blind nobleman was born around 1590 in Heusden. He moved to Utrecht in 1625, to work as city musician (carillon and recorder), bell expert and composer. He died in 1657. He might well be called the dj of the seventeenth century. During the recitals on the place called Janskerkhof, Jacob van Eyck played sets of themes and variations on the recorder. The themes he took from the international hit repertoire of his time. The major testimony of these recitals, that delighted citizens on their afterdinner walks, is Der Fluyten Lust-hof. This collection of music is rightfully famous. The music - loved by its high quality and feared by the difficulties it poses to the player - is known and played by everyone involved in the recorder. Blind since he was born, Jacob van Eyck had an exceptionally sharp ear. He succeeded in unravelling the tonal structure of bells, and discovered the way in which they can be tuned. His cooperation with the Hemony brothers led to the first well tuned carillons in history. To this a carillon of Hemony counts as a ‘Stradivarius’, and the carillons of both the Utrecht Dom and Nicolaikerk are shining examples. JACOB 3.0 is a cooperation of the Early Music Festival, Gaudeamus Muziekweek, Culturele Zondagen, Kytopia and Residenties in Utrecht. Saturday 9 July Vlaardingen celebrated Carillon Day, which came in the place of the former Vlaardingen Carillon Weeks. The travelling carillon of Douai (F) moved along the Vlaardingen streets for two and a half hours, after which the main program was given at the Lijnbaanplantsoen. This is new park within hearing distance of the Oranjecarillon at the Markt, around a historic ropery that provides hundreds of sheltered seats. The travelling carillon was played by Kenneth Theunissen, Richard de Waardt and Jasper Depraetere, a 16 year-old student from Mechelen. Bas de Vroome, at the Oranjecarillon, joined them a few times, for instance in two variation cycles, in which the two carillons complemented each other. There was a special bus that provided transportation between homes for the elderly and the park. The 600 chairs were almost all occupied. Like every year there was a Carillon Quizz, with questions regarding bells and carillons. The winner was selected by the Flemish chansonnière Della Bosiers, the whole was presented by actress Mary-Lou van Stenis. Next to the music, listeners could enjoy carillon bear and specially made cheese cookies. The program was concluded by the world champion in whistling, Geert Chatrou, accompanied by Richard de Waardt. The rehearsal had been at the digital practice keyboard of the Big Ben Foundation - probably the last time it was used in this way, since the foundation offers it for sale. The next Vlaardingen Carillon Day is planned on Saturday 8 July 2017. However, organizer Ben van der Linden fears that lack of funds will put an end to this beautiful initiative. He and hundreds of listeners call upon the municipal authorities to keep supporting the manifestations, that have proven to be so successfull. A carillon seminar took place on Saturday and Sunday, November 14 and 15, 2015 at Saint Petersburg State University, Russia. It was organized by Jo Haazen, Professor for Carillon and his assistant Alexandra Kapinos to celebrate the tenth anniversary of the Department of Organ, Harpsichord and Carillon of the Faculty of Arts. On Saturday nine lectures were given on Jacob van Eyck (Ekaterina Lomakina), Claude Fremy (Irina Kozlova), Matthias van den Gheyn (Tatiana Mordvinova), the carillon school Jef Denyn (Alexandra Kapinos), the carillons of the world (Yana Trombinskaya and Andrey Markelov) and learning to play the carillon (Jo Haazen) as well as on Russian bellringing (Olesya Rostovskaya) and the use of trees as belfries (Sergey Starostenkov). I lectured on the Carillon in Berlin-Tiergarten. Afterwards we went to the newly restored Fyodorovsky Cathedral, which had been built to commemorate the 300th anniversary of the Romanov family’s ascendancy to the throne of Russia. Olesya Rostovskaya and Vladlen Pigarov played the new 16 bell zvon dedicated to the last czar and his family. On Sunday I played a concert on the carillon installed by Petit and Fritsen in 2000-2001 in the Saint Peter and Paul Cathedral to replace the 37 bells cast in 1760 by Nicholas Derck from Hoorn. The B-flat bourdon weighs 6,779 lbs, the 51 bells weigh 16 tons. The program included classical and popular music from Germany and Russia and carillon music by the Russian composers Alexander Knaifel and Sergey Tossin. In the first months of 2016 the organization of the Lithuanian Pazaislio Muzikos Festivalis asked Dutch carilloneurs to give concerts on the carillons of Kaunas, Klaipeda and Vilnius, during the ‘Vilnius Culture Night’. Thanks to mediation of the artist Joop Visser and the Dutch ambassador Bert van der Lingen, four concerts could be given. Lina Krepstaite, from Lithuania, took care of travel and stay of the four musicians, which she did perfectly. In June Auke de Boer and Bauke Reitsma travelled to Lithuania, and one month later Gerda Peters and Gijsbert Kok. In the upcoming issues of Carillon News those four carilloneurs will review the concerts and the somewhat unknown instruments. Gijsbert Kok is the first to do so. His concert was on Saturday 23 July, 19:00 h.
From 21 to 24 July Gerda Peters, Menno Hoekstra and I visited the three carillons of Lithuania: Vilnius, Kaunas and Klaipeda. The last was once known as Memel, after the river which banks it occupies. Because of the strategic position at the coast Klaipeda was heavily struck in World War II. If in the other two cities we can find many towers and churches, in Klaipeda these are almost absent. Two spots where once a church stood, are now marked by a monument and a swinging bell. No surprise, therefore, that the carillon of Klaipeda is not in a church tower. It hangs in the spire on the old main post office. Next door, the garden of the bell and clockwork museum offers a good listening spot. In the street the carillon sounds somewhat loud, perhaps even agressive. In the garden the sound is fine. The carillon was cast by Eijsbouts in 2006, with 48 bells, based on f1. It replaces an 1987 instrument by Schilling (Apolda, former GDR). Carilloneur Kestutis Kacinskas plays every Saturday from 12:00 to 12:30, and there is always a small group of attentive listeners. The carillon is well kept en in good condition, be it that the software of the electronic practice keyboard was not working. For me this concert - thanks to the combination of the instrument (if played delicately), the audience, the lovely garden and the fine summer evening - was an idyllic experience. - Gerda Peters and Gijsbert Kok regulate the keyboard in harmonious cooperation, overseen by Klaipeda’s carilloneur, Kacinskas Kestutis. ANTWERPEN - Yesterday K3 gave a unique concert in the bell tower of Our Lady’s Cathedral. For one hour they sang their hits, accompanied by city carilloneur Liesbeth Janssens at the carillon console. Down at the Grote Markt hundreds of children watched the show. ‘This must be the smallest venue where we ever performed’, thus a smiling Marthe. The children at the Grote Markt were somewhat surprised by the unfamiliar sounds of the carillon, but danced enthousiastically om hearing hits such as ‘10.000 Luchtballonnen’ or ‘Tele-Romeo’. Fans could also listen at the bel-etage of the town hall. Carilloneur Liesbeth Janssens saw a dream come true: ‘My 11 year-old daughter is a big fan of K3. I played their songs for some time on the bells, and wanted to cooperate for a long time. Eventually my colleague Koen simply asked them if they would like to join. Luckily they spontaneously said yes. Their songs are in melodic style with constantly changing harmonies. That makes them fun to play and easier than for instance rap-music, such as I played last year with Slongs Dievanongs. The special carillon concert with K3 was an initiative of the Vleeshuis Museum, wich’s project Klank in de Stad (Sound in the City) wants to put a spot light on historic music and the carillon. It comes from Prague, but Sunday afternoon the travelling carillon appeared on the Tilburg Oude Markt. Not without a reason, for that day Tilburg celebrated the 50th anniversary of the carillon in the tower of the Heikese Kerk. Helped by lots of sunshine and a great audience, the festivities concentrated on the open air concert by Carl van Eyndhoven with the motto ‘Bells, Brass and Bubbles’. Van Eyndhoven played the 57 bells of the 5000 kg travelling carillon, together with brass ensemble KoperSlag from Hilvarenbeek. A carillon from 1925 in the tower of the nearby Jozefkerk, was robbed in 1943 by the Germans. After the war Tilburg citizens and companies raised funds for the new carillon. It has 50 bells, its bourdon weighing 420 kg. Click here for (a part of) the concert. Will your composition soon be played by the Lommel carillon? LOMMEL - In the summer of 2016 the carillon of the Sint Pieterbandenkerk will have a new carillon computer installed. Connected to this CC De Adelberg, in cooperation with city carilloneur Liesbeth Janssens and the Kunstacademie Noord-Limburg, organizes a composition contest for automatic carillon music. Money for the new carillon computer is given by the Lommelse Teutengilde vzw. The new, fully automatic computer makes it easy to play new compositions and melodies on the bells. The winning tunes of the composition contest will be programmed on the new computer. The contest is open to anyone who can write music or provide music as a midi-file. We expect your composition before 10 September 2016. Around 15 September the contributions will be juried. The awards will be given on Wednesday 28 September 2016 in the Public Library of Lommel. The winning tunes will be heard that day. The contest has interesting prizes. For the complete contest regulations click here. The next Dutch Carillon News will appear at the beginning of August. Please submit copy (maximum 250 words) for this issue before October 3rd to redactie@beiaardcentrum.com. The editors reserve the right to shorten texts or to make editorial changes in a conscientious fashion.